Sedona is sheer southwestern beauty! For that reason alone, it makes the top 10 list of towns to visit. Of course, the temperate high desert climate is another great reason to visit Sedona, especially to get away from the cold northeastern winters. The Sedona area features diverse outdoor recreation, the spectacular Red Rock Country, shopping and cultural events, and historic sites. Adjacent to the Sedona Area is the lovely Oak Creek Canyon and the fun Slide Rock State Park where you can watch kids (and grown kids) sliding down the slippery creek. Oak Creek Canyon is great for fishing, hiking, photography, and picnicking. In addition, Oak Creek Canyon is an outstanding place to view fall colors. It is always thrilling to see the red canyons and mesas of Sedona. These red rock formations were sculpted over the ages by the erosive effects of wind, water and ice. The reddish sandstone acquires its hue because the iron component oxidizes. Some of the favorite formations are Bell Rock, Cathedral Rock, Coffee Pot Rock and the Courthouse Butte. 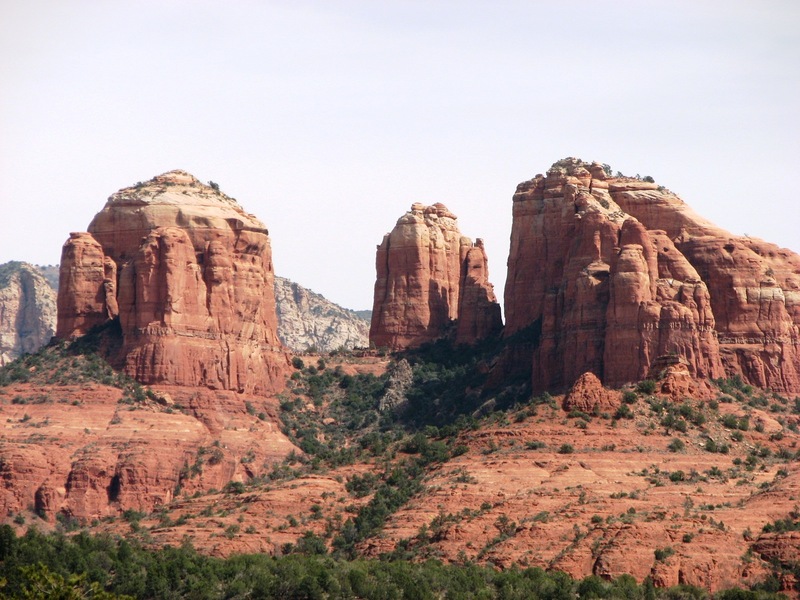 One other amazing combination of natural red rocks and man-made architecture can be found in Sedona. This is the picturesque Chapel of the Holy Cross. The chapel is a great place for reflection and spiritual renewal. It towers 200 feet from the surface among the red rock formations. The 90 foot tall cross is nestled among the rocks. And just in case you haven’t heard…God created the Grand Canyon BUT He lives in Sedona!